ABOUT THE ULTIMATE COASTAL RETREAT ? Select residence type below to view locations. The peninsula truly feels like a Costa Rican island of its own. Such a unique sanctuary should have its own architectural vocabulary. 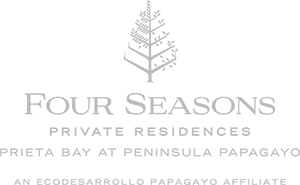 Four Seasons Private Residences Prieta Bay at Peninsula Papagayo are not owned, developed or sold by Four Seasons Hotels Limited or its affiliates (Four Seasons). The developer, Residencial PLV, Limitada, uses the Four Seasons trademarks and tradenames under a license from Four Seasons Hotels and Resorts B.V. The marks “FOUR SEASONS,” “FOUR SEASONS HOTELS AND RESORTS,” any combination thereof and the Tree Design are registered trademarks of Four Seasons Hotels Limited in Canada and U.S.A. and of Four Seasons Hotels (Barbados) Ltd. elsewhere. Floor plans, drawings, images, renderings and other material presented herein are for illustrative purposes only, are not to scale and should not be relied upon as a basis for purchasing. Dimensions and square footage are approximate and may vary with actual construction. The developer reserves the right to make modifications or substitutions should they be necessary.